Going Nutty! : Yeah! Inside Recess! Inside Recess was AWWWWWWesome today! I am so glad that it rained last night! Recess was an extra 17 8 minutes today so that everyone got a chance to play. When you say it though- you have to pronounce it this way SKA- WHIRLLLLLLL! I totally DOMINATED won a couple of times and I was all like IN YO FACE!!! Good Game, Thanks for Playing. Ask the MR and the Littles- I am a sore loser- but an even WORSE winner. We have 14.5 days left- that's it. 14.5 days to put a pretty ribbon on first grade. 14.5 days to make sure they have all learned what they were supposed to learn. I never get to stay in my daydream long enough to find out his name!!! Haha, glad you were able to play! I'm a horrible person to play games with. If I don't think I'm going to win- I cheat. And even if I think I'm going to win, I cheat anyway just to make my win even sweeter! BUT, I am honest about it- before we start the game, I always tell my friends that I cheat and it's OK since I was upfront and honest. right? and I loved the lil M&M guy- hilar. 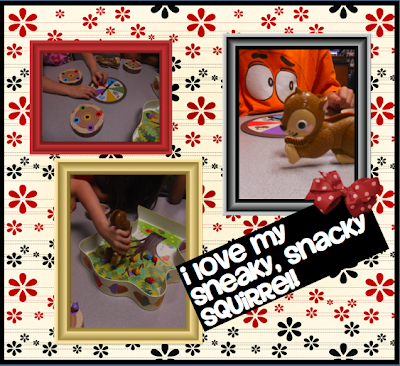 Awww I have been eyeing that snacky squirrel game forever! I totally want it for my class! I usually let my class win if we play games but I have to be very tricky because they're starting to catch on. Even with that game I would never say indoor recess is awesome though! I saw something squirrelly today and thought of you but now I can't remember what it was! We have 15 more days now and then I will be joining you for those Mai Tais!